Today is the birthday of several good friends. And I wish them LOTS of happiness as they celebrate another year of life to share with loved ones and good friends. It also is the inauspicious anniversary of my late husband Keith’s passing at only 54 years old…the same age that I am now. You can read lots elsewhere in this blog (starting at summer of 2012) about the transition through his rapid decline to death to the journey of grief and resilience that I have undergone. He was my best friend, lover, and husband of 30 years. He was someone I would trust without question, share in heartaches and celebrations, and the journey through parenthood raising our two beautiful daughters Sarah and Anastassia. Today it has been three years since your passing, Keith. A lot has happened. I have grieved… and still do. But I have also moved forward with many of life’s demands and the promises I made… to you, and to myself… and to others. I have embraced joy in the form of a future grandchild expected in December. And I’ve embraced building a life filled with happiness and love in my marriage to my second husband, Steven, who understands that you came before him. He honors you and protects me. Sometimes he is quick to get upset, mostly out of frustration, when he feels unsuccessful in protecting my interests, or feels slighted by a family member. He is learning the art of nuance and patience. He is learning that what others say or do is not about him, nor is it meant to impugn him. He is learning to let go of the wounds of his other life before me so that it doesn’t fracture an otherwise beautiful relationship. And I am learning to feel your presence as a guide, to look around me and examine it through your eyes. This has become especially important as we move forward building a new home on Perry Road. You and I and Steven all came from a tradition of craftsmanship. This included a respect for workmanship, the materials, and the process. Things were carefully planned, constructed in the right order, with attention to detail. When it came to homes, it was about making them last, energy-efficient, and beautiful. As I look at the workmanship of some of the rough framing crew, I am appalled. It has left me – and especially Steven – stressed. We are determined to keep the project moving forward, but only if the workmanship is up to our standards. It is hard to let go. And some things, I admit, I am willing to let go. For now, after several days of stressful challenges to the contractor, I am willing to see what he will do to keep to his promise to address our concerns. Yes. It’s been three years. But I still depend upon you to guide me and give me strength to keep moving forward. 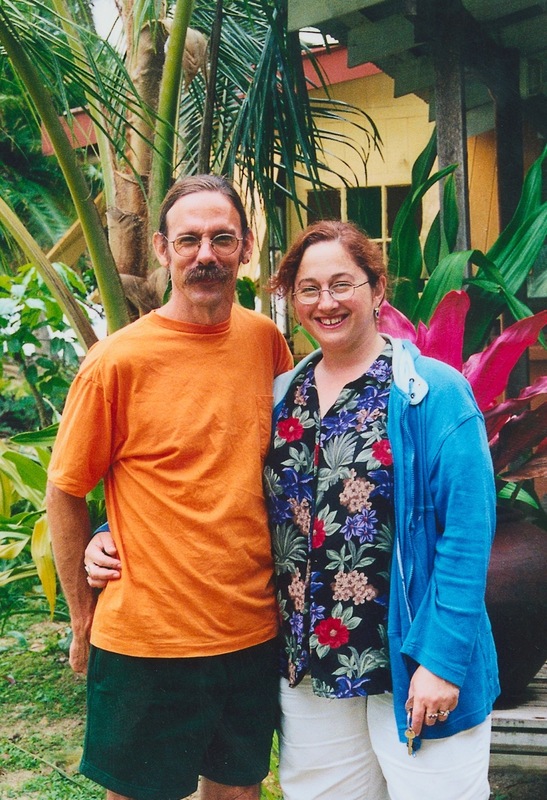 Photo: Keith and me in Fiji in 2001 chaperoning students. We were chaperoning a large group of community college students on a study tour to our old stomping grounds in the South Pacific. Keith felt like he was the “dad” to them all – young and old.